Just Another Static Monday – Let there be Light! – Science is Fun! If you ever get stuck in the dark with a fluorescent light bulb and a balloon (or even a length of PVC pipe or a plastic comb), don’t worry. You can use static electricity to light up the bulb and find the light switch (that is assuming the bulb you have is not supposed to be in the light fixture). Any fluorescent light bulb will work – the coiled up compact type or the long narrow kind. Simply charge up the balloon (or comb or pipe) by rubbing it vigorously on your head so that it is full of extra electrons. Then hold the light bulb near (but not touching) the balloon to see the bulb glow. You will be able to see it best in the dark. 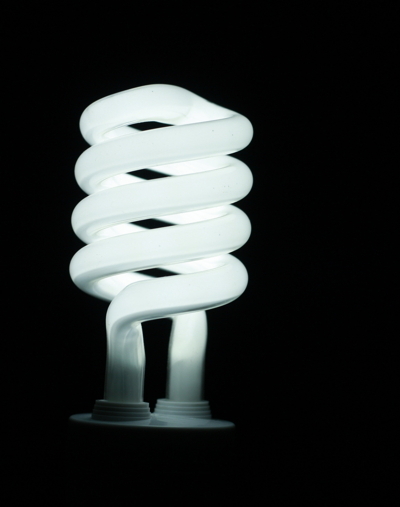 A fluorescent light bulb usually works when electricity causes mercury vapor in the bulb to emit ultraviolet light. Our eyeballs can’t see ultraviolet light but the phosphors coating the inside of the light bulb to soak it up and then emit visible light that we CAN see. In this case, instead of sending electricity into the bulb, we hold a charged balloon near the bulb, which stirs up all the electrons in the mercury vapor causing an electric current that causes the mercury to send out ultraviolet light and the phosphors to glow. Experiment with different arrangements of the bulb and balloon to produce the most light. What happens when the bulb touches the balloon? Does the balloon, comb, or PVC pipe light up the bulb best? What else can you use as an electron source besides your hair? Does this work with other types of light bulbs like incandescent, halogen, and LED?